The shock absorbers ensure a secure and comfortable driving experience. Your shock absorbers are part of the suspension which makes sure you don’t feel the bumps in the road as much as you would without it. At the same time, the shock absorbers help to keep the car stable on turns and curves on the road. The shock absorbers are therefore helping to a create comfortable driving experience, but also has an impact on safety. Therefore it is extremely important that they are always in good condition. How does shock absorbers work? It is the shock absorbers that provides a comfortable driving experience. Without them, every rock and every pothole feels like a blow to the car, and thus you. Each time the car would lose grip when being lifted from the road on a sharp turn, the shock absorbers ensure your vehicle stays grounded, and gripped to the road surface. The shock absorbers ensure that the wheels can bounce up and down to a certain limit without the car following. It is the sway bar that provides the transfer of power across the wheels in curves, to compensate for over – or under steering. Shock absorbers do not have any specific mileage limit since it depends on the quality of the road you drive on. The more bumpy road, the greater the wear. If the vehicle is flying across the road when turning, or it throbs every time you run over a small bump it’s time to replace the shock absorbers, or at least get them checked out by a mechanic. There are some clear indications if your shock absorbers are defective. You can test most of these items yourself, and find out whether they should be serviced. Simply, sit down on the front or back of your car and get up again. The car should move gently down and in one smooth motion return to the starting position. It must not be uneven and not be too fast. Another method with the same result is to push the car down several times in all four corners. Again it should be smooth movement down and up, to the same position. If the car ”sails” when turning gently on the steering wheel, and it feels like the car is moving from side to side, even if you drive with smooth turning motion get them checked out. When you drive over a pothole or a bump, and the car is not suspending, but jerks hard up and down or vice versa. You will often hear a kind of knocking sound when the car hit a hole or bump if the suspension is defective. If driving over a pothole or bump and the car rocks for a few seconds, instead of being stable right away. If you look under the wing, or crawl under the car and can see a rusted part on the piston. The piston is often wrapped in rubber, which can make it harder to detect. Are you picking up furniture of heavy supplies, moving for a buddy or a girlfriend – or going camping with your caravan? In all these situations you should check the shock absorbers before you apply anything to the tow bar. * If the suspension is not top notch, the drivability is weakened, which compromises the security. If the car is unstable, it will skid easier, and if there is weight on the tow bar, the car will react differently and the front tyres may have less surface grip. * If there is rust on the free part of the shock absorbers, you risk the gasket becoming damaged, or that rust gets into the piston core. What parts are included in the shock absorbers? When you talk about shock absorbers, there are several parts involved, each of which may be faulty. Most service manuals have incorporated a check of the chassis, and here the mechanic should also check the shock absorbers. If in doubt, ask the mechanic before your service. Suspension: The basic principle of suspension is that a spring is added between the chassis and the wheels. This way, the spring can make sure that the wheels are kept on the road, so the car does not loose grip when hitting a hole or bump. The springs take the impact so that it doesn’t effect the car or the comfort of the passengers. The spring is very inflexible and cannot tolerate too much extension or compression. Therefore, there is a shock absorber that helps to make the movement smoother and softer. Shock absorber: The shock absorbers are additional protection for the suspension, so it does not extend or compresses too vigorously. It also dampens the spring’s own movement, so the car becomes stable faster. Bump-stop: The suspension has some rubber pads to ensure that in extreme cases the piston does not just hit the bottom or the top of the suspension, but stops more gently. Wishbone (carrier arm / swing arm): It is the wishbone holding the spring and the shock absorber to the chassis. In order to mitigate noise and rumble from the road, the wishbone is top mounted in rubber bushings. It is rare that the wishbone breaks, but the bushings and/or the rubber will get defective over time. If the wishbone is not functioning optimally, you risk the tyres being worn unevenly, as it is the wishbone that provides the right angle on the deck to the road surface. A defect wishbone can also damage the brake system and brake pads. Stabilizer bar: When the car turns, there is a risk that the tyres lurch. The higher the speed and sharper the turns, the greater the force on the tyres. If the angle between tyres and road is wrong, one set of the tyres can lift off the road, to counteract this anti-roll bars are fastened between the two front tyres and the two rear tyres. 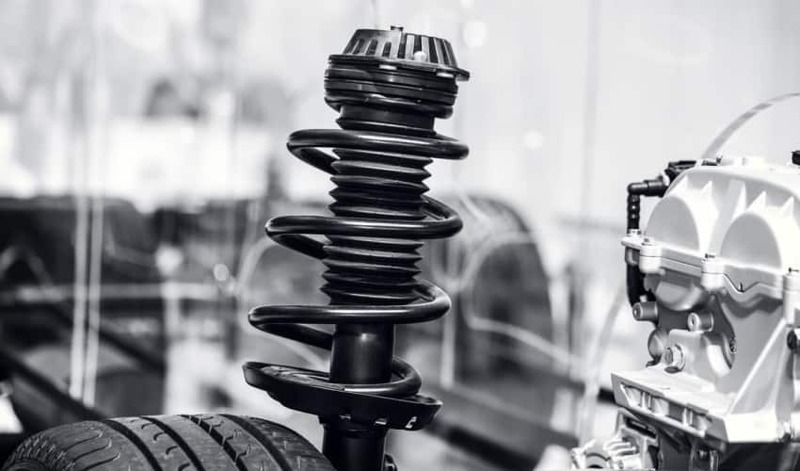 How Does the Suspension and Shock Absorbers Work? What are The Shock Absorbers?